For Sale 1973 passenger car Porsche 911, West Palm Beach, insurance rate quote, price 30000$. Used cars. For Sale for 30000$ passenger car Porsche 911 1973 in excellent condition, West Palm Beach, insurance rate quote. Used cars. Body: 2 doors coupe Brown. Just email me at: aleenahhelberg@celticfans. com . 1973 PORSCHE 911T with a 1988 3. 2ltr Mototronic Fuel Injected Engine. Authority mass flow sensor with Chip, lightweight flywheel, lightweight pressure plate with carbon fiber clutch. MSD ignition, headers, lightweight stainless steel sport muffler, lightweight starter, Rennline solid motor mounts. $7K rebuilt 915 transmission with 7:31 gear and factory Porsche LSD with 80% lock up. Hargett mid-mounted shifter. shocks. Tow hooks. Solid suspension mounts, Fuchs wheels. Continental tires, Hella Euro headlights. Rennline aluminum pedals, dash and floors, lightweight RS door panels and carpet. ATL fuel cell, duel fender mounted oil coolers. Safecraft Fire System. Too much to list. . . . . Very quick, very fast, Sounds amazing! 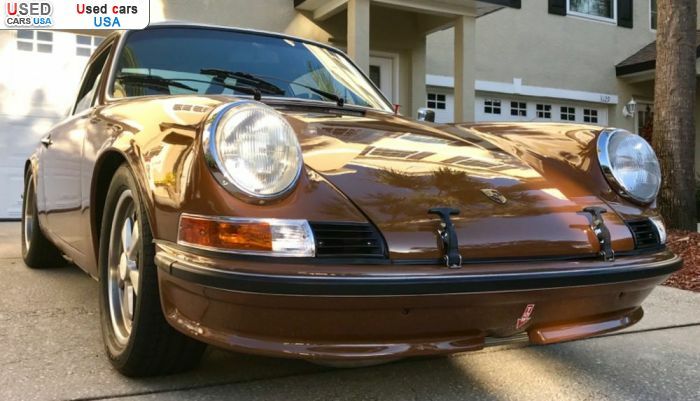 Fully serviced with valve adjustments. .
Only: 0	comments on "For Sale 1973 Porsche 911 ". For Sale passenger car 2012 Porsche 911 Urgently!